Epact: Diptych Dial unsigned, circa 1600 ? This dial has simple geometrical decoration on the borders of its ivory leaves, but its compass card is finely painted in red, blue and silver. A fleur-de-lis marks the north, and the needle is also finely made. 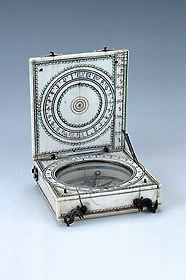 Painted compass card s were typical of Spanish and Italian dials, hence the attribution of this example.